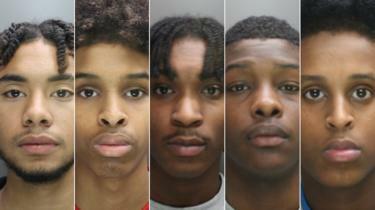 Five teenagers who "tortured" a 15-year-old boy to death have been sentenced to life in prison. Kai Fisher-Dixon, Shuayb Mahomud, Tremayne Gray, Omarion Stephens and Abdulqaliq Mohamed attacked Jacob Abraham in Waltham Cross in December. The boys, all aged 15 and from Enfield, north London, denied murder but were found guilty by a jury after a five-week trial at St Albans Crown Court. The judge said: "The purpose was to punish him [Jacob] by the deliberate infliction of serious pain and humiliation, but to leave him alive. "That was what I meant when I used the word torture in the course of the hearing and I do not shrink from it." Stabbed EIGHT times... but the judge thinks that there was no intent to kill him...!!!??? Re: Five teenagers who "tortured" a 15-year-old boy to death have been sentenced to life in prison. As the Judge properly ruled. BBC wrote: The judge said: "The purpose was to punish him [Jacob] by the deliberate infliction of serious pain and humiliation, but to leave him alive. There is only one category of murder here!!! And the jury decided they were guilty of it!!! The judges opinion means nothing to the verdict the jury gave!!! Tommy Monk wrote: There is only one category of murder here!!! Right. The Judge's opinion bears not on the verdict, but on the sentence. The judge has to follow the sentencing guidelines for the verdict reached by the jury!!! If they had cut of the victims head and claimed not to intend to kill him... do you think the judge could say that he believed them that they didn't mean to kill him...? Tommy Monk wrote: The judge has to follow the sentencing guidelines for the verdict reached by the jury!!! Tommy Monk wrote: If they had cut of the victims head and claimed not to intend to kill him... do you think the judge could say that he believed them that they didn't mean to kill him...? The Judge was following guidelines in building a case for the sentence. He's a good judicial craftsman. That's because it calls for the state of mind of another. You need to ask the Judge your hypothetical. I presume that the judge was confirming what the prosecution had claimed. Dear tommy...why don't you ask your own mother. She doesn't know any more, or less, than I know about the Court's state of mind. It appears that the Judge filled in the gaps as to what the law requires for sentencing purposes. That's what one would expect him to do, so it's my expectation. Your hypothetical question about cutting off the victims head is pure conjecture. What if the victim were under indictment for tax fraud? You could reset the stage any number of ways...how do I know? The point I'm making, is that here in England, to be found guilty of murder, it doesn't matter how much the accused tries to claim no intent to kill if they have deliberately inflicted enough serious/severe life threatening injuries on someone, that would have most likely result in death and they would have known would most likely result in death, and does result in death of the victim...! The claim of 'I didn't mean to kill them' is completely null & void, when the level of intentional violence and injuries inflicted goes way above & beyond the type that is generally considered to be 'non-lethal', and far into the level of violence that is undoubtedly 'highly lethal' & most likely to result in death, and would have been known by attackers to be so! That is why they were found guilty of the murder! And that is why the judge was wrong to say 'no intent to kill'... because he is contradicting the law and the jury, whereby the level of violence and deliberate infliction of 8 deadly serious stabbing injuries, was way beyond the realms of being 'non-lethal' and them being unaware that death may result from their actions of inflicting these life threatening stabbing injuries...! Basically... you don't deliberately lure someone to a place to launch a lethal knife attack on them, and stab them 8 times in cold blood... without knowing full well that they would likely die as a result!!! But that was not the case here...! And the jury found them guilty of murder... as described above...! Tommy Monk wrote: And that is why the judge was wrong to say 'no intent to kill'... because he is contradicting the law and the jury, whereby the level of violence and deliberate infliction of 8 deadly serious stabbing injuries, was way beyond the realms of being 'non-lethal' and them being unaware that death may result from their actions of inflicting these life threatening stabbing injuries...! Lawresources wrote: The law of murder is set out in common law. The legal definition of murder is 'the unlawful killing of a human being in the Queen's peace, with malice aforethought'. The actus reus of murder consists of the unlawful killing of a human being in the Queen's peace. The mens rea of murder is malice aforethought, which has been interpreted by the courts as meaning  intention to kill or  intention to cause GBH. The Judge was merely stating his findings of fact. It's the finding of the jury, of guilty of murder, that counts... and the 3 partial defences you quoted were not applicable here...! It was simply murder... all found guilty of it and for which they all received mandatory life sentences! Tommy Monk wrote: It's the finding of the jury, of guilty of murder, that counts... and the 3 partial defences you quoted were not applicable here...! To the contrary, the Judge still has to find facts, to do his job. Tommy Monk wrote: It was simply murder... all found guilty of it and for which they all received mandatory life sentences! No question. It was murder, according to the judge, by the second prong of the law. It's right there, if you read closely. The Court pronounced it. Not 2nd degree murder (which doesn't exist here)... that you tried claiming it was...! I'm glad that you have finally admitted you were wrong, and I was right! And, I even said it before you. You need to pay attention. Tommy Monk wrote: Not 2nd degree murder (which doesn't exist here)... that you tried claiming it was...! Second degree murder is an American term, but analogous to the British common law definition, second prong. Tommy Monk wrote: I'm glad that you have finally admitted you were wrong, and I was right! Yes, well you needed correcting and I offered it. Now, your take-home lesson for this evening is to read more carefully what others are saying. Your constant misinterpretations interrupt the conversation. It becomes tedious waiting for you to catch up. As I keep telling you! Read the law, tommy. It's not me you are contradicting.